There’s nothing like the smell of bread cooking in the oven. Sweet and delicious. Like the bakeries of the small towns where I’ve been. Definitely smell of yeast, of flour, but also of sugar, and butter. It’s morning and the house is quiet. Everybody is out and about tackling their day and the cats are curled like two furry balls, sleeping soundly, one on the couch, the other one in his bed. 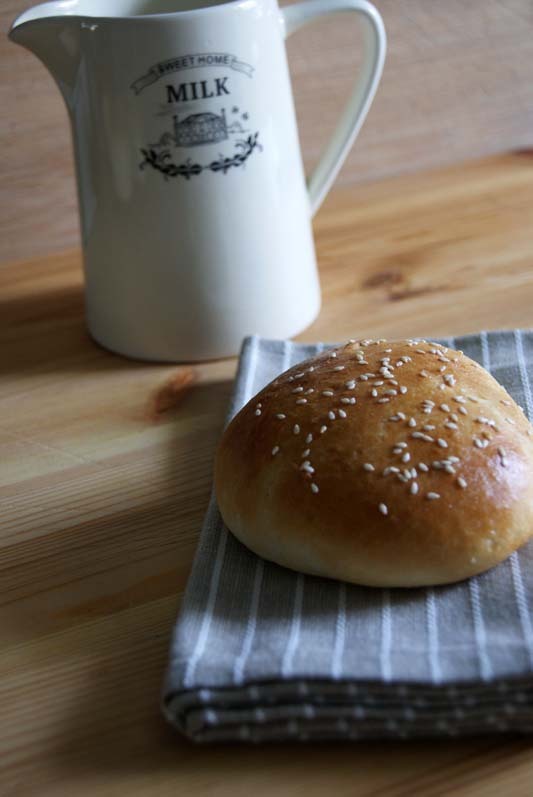 I want to make brioche buns, today, so I start arranging all the ingredients I need on the island, the flours, yeast, water, sugar, salt, butter, eggs and milk. It will be a long morning. Patience is my ally. There’s no rush in bread making, you need time, love and care. I had planned to go to yoga, this will be my yoga time today. Another hour or so to wait for their second rise. Another hour to be around, checking emails, reading a book, making a grocery list or planning the weekend. They’re puffy and twice the size they were. A brush of egg wash, a sprinkle of sesame seeds on top and in the oven they go. I check the oven while they’re cooking. I’ve been checking on them all morning, like a caring mother. I like what I see and what I smell. The time spent in making them was well worth it. I carefully separate them (they’re like siamese twins attached to one another,,, maybe you can use a bigger pan and let them expand more on their own), I let them cool on a rack, and drool in anticipation of when I am going to taste them. 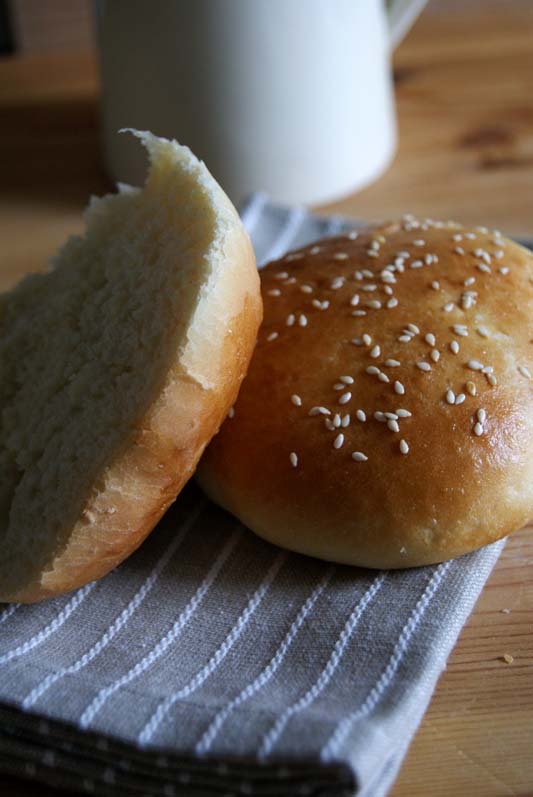 The texture of these brioche buns is soft, light and fluffly, there’s no overpowering taste of eggs or butter, just the perfect combination of deliciousness. They were great with the hazelnut spread for my sweet cravings, they will be perfect for my husband’s creativity tonight for supper, wether burgers, sandwiches or pulled meat buns. Adapted from a recipe found on The Clever Carrot. In a glass measuring cup, combine 1 cup warm water, 3 tbsp. milk, yeast and sugar. Let rest until foamy, about 5 minutes. Meanwhile, beat 1 egg. In the bowl of a stand mixer, add the flours, the salt and butter. Mix the ingredients until crumbly. Stir in the yeast mixture and the beaten egg. Run the mixer on medium-low until a dough forms, about 8 minutes. 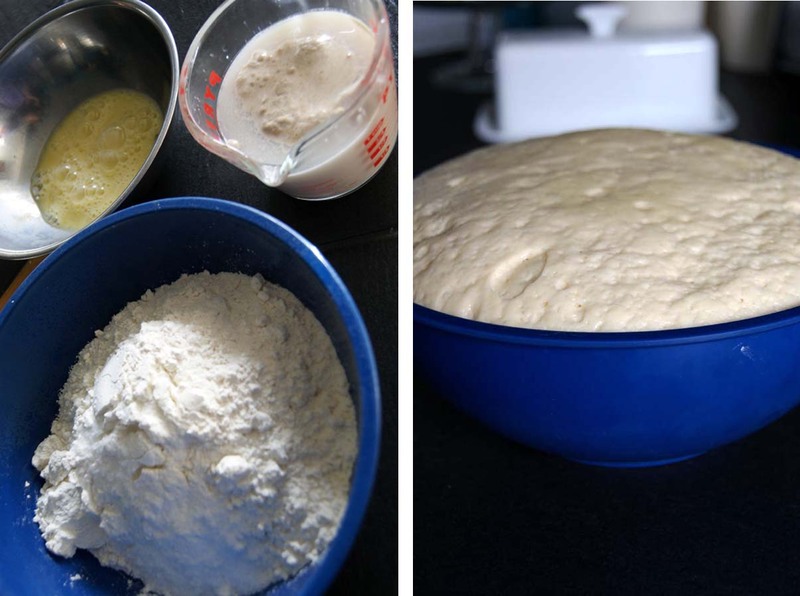 Shape the dough into a ball and return it to the bowl (it will be sticky and wet). Cover bowl with a clean, damp kitchen towel and let the dough rise in a warm place until it has doubled its size, about 2 and 1/2 hours. Line a baking sheet with parchment paper. Using a dough scraper, divide the dough into 8 equal parts. If you have a scale, weigh each piece so that they’re all about the same size. To shape the dough into balls, gently flatten each piece, then pull up each side pinching it together in the center. Repeat until the ball is sealed. Flip the ball over (seam side down), place it in your palm and with your other palm gently roll into a smooth ball. Transfer to a parchment lined baking sheet, placing them 2 to 3 inches apart. 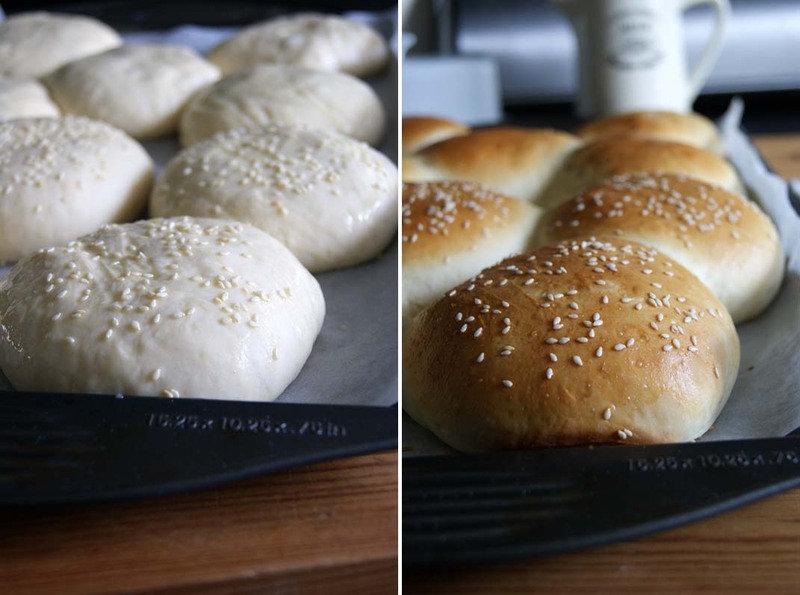 Cover loosely with plastic wrap (lightly sprayed with oil) and let buns rise in a warm place for about 1 – 1 and 1/2 hours, or until puffy and slightly risen. To make the egg wash, beat the remaining egg with a splash of water. 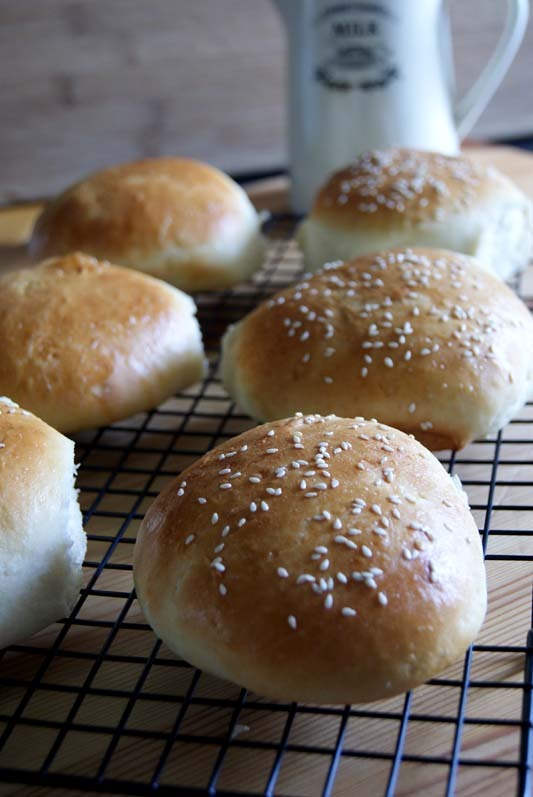 When the buns are finished with the second rise, gently brush each one with egg wash. At this point, you can sprinkle sesame seeds onto your buns if desired. Preheat your oven to 400°F and place a shallow baking pan on the oven floor. Before the dough goes in, add about ½ cup of water to the pan (to create steam). This will help keep the bread nice and moist.